With all the advancements search engines have made, a lot of folks in the SEO world are circling back to a fundamental question: If I’m targeting a particular keyword, where and how often should I use that in the front and back ends of my page? 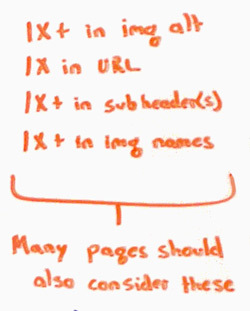 In today’s Whiteboard Friday, Rand puts his recommendations into the context of today’s SERPs. Howdy, Moz fans, and welcome to another edition of Whiteboard Friday. 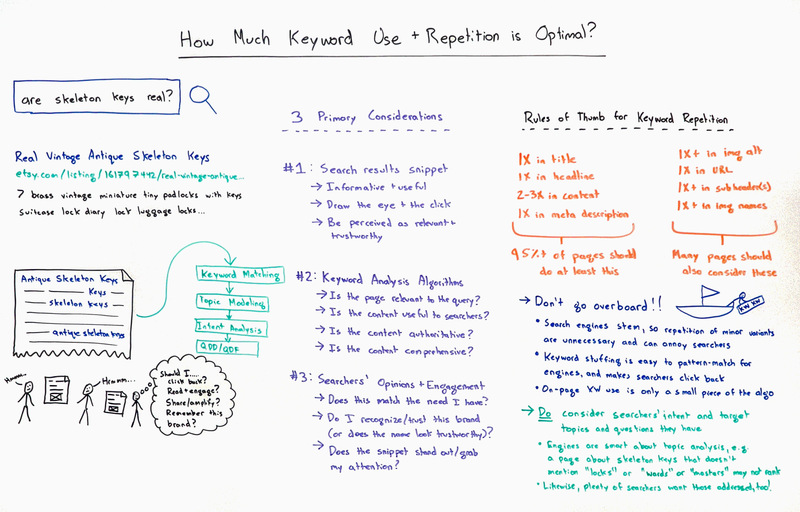 This week we’re going to chat about keyword use, keyword repetition and overuse. I know this might seem like a basic topic, but actually it’s advanced a little bit in the last few years, and I still get a surprising amount of email and see a surprising number of questions around things like, “How many times should I use my keyword that I’m targeting to rank for in my URL string or my H1 tag or my title? Or how many different pages should I have that target this keyword?” So let’s try and clear a little bit of this up. You see lots of documents ranking in Google that don’t perfectly match this keyword set. I think that’s a good example of how far Google has come in trying to understand the intent behind queries, how far they’ve come in terms of connecting topics and keywords, how far they’ve come on topic modeling algorithms. So really there are three primary considerations that we do still need to worry about as SEOs. The first one is the search result snippet itself. I’ve taken Etsy’s snippet here, which is not fantastic. Then when you get to the page, that product is actually gone, and Etsy is suggesting some other ones, which aren’t skeleton keys. Kind of frustrating because they do have skeleton keys if you search on the site. In any case, I’m sure Stephanie and the SEO team over at Etsy will take care of that ASAP. The primary considerations in your search result snippet are: Is the result informative and useful? I want to be able to look at this and think to myself, “Aha! That tells me something that I didn’t already know, or it starts to tell me something about whether or not skeleton keys are real or not and where they come from and history and what they are.” Is it useful? Can I apply that information? Is that going to help me accomplish whatever I’m trying to accomplish? In this case, a very information-based query, so the only accomplishment is the knowledge itself. Is it going to draw the eye and the click? This is a great reason why rich snippets are so valuable and why anything you can do to bulk up or add to your snippet, get more vertical space, make your listing stand out can be helpful. Then is it perceived as relevant and trustworthy by searchers? So a lot of times, that’s going to be a brand consideration set. They’re going to be looking at the domain name. They might be looking in the title for a brand there, if it is there, if it’s not there, those kinds of things. This is kind of the classic thing where I think a lot of early SEOs get lost and maybe even some folks who have been around for a long time remember back in the day when Google and Yahoo and old MSN search, before Bing, would actually look at the count and the repetition numbers, probably never actually used density, but they probably did use simplistic algorithms like TFIDF, term frequency times inverse document frequency, looking for those less frequently used terms across the Web and seeing if you have a higher concentration of those in your document than other people do. Well, now there are probably still some elements of keyword matching. Google is likely to give you a little bit of a boost if you say, “Are skeleton keys real?” and everybody else says, “Real vintage antique skeleton keys,” or something like that. I’m not suggesting against using this actual keyword phrase precisely. If you know that’s what your article is about, that’s the piece of content that you have and those are the searchers you want to target, yeah, go ahead. Make the title of the piece, “Are Skeleton Keys Real? We Dig Into History to Find Out.” That’s a compelling title. I would click on that if that were my search query. So there are some keyword matching elements. There’s probably some topic modeling, well, almost certainly some topic modeling stuff where they’re looking at, “What are other terms and phrases that are frequently used when we see skeleton keys used?” If we do see those terms and phrases on other people’s pages, but we don’t see them on yours, we might not consider your document to be relevant to the keyword. Maybe you’re talking about skeleton keys as a new programming language. Maybe you’re talking about the skeleton key mobile app. I don’t know if that’s a real thing, but it could be. Maybe Skeleton Keys is the name of your dog. They don’t know. So they look at these topic modeling sorts of algorithms to try and figure out, “Oh, okay, look, they’re talking about locks. They’re talking about antiques. They’re talking about history. I think we can be relatively assured that, yes, this document is on the topic of skeleton keys.” If you don’t use those words and phrases, the topic modeling algorithm is going to miss you. Look, sometimes when you get analyzed for this, if you are not serving the same intent, so if you’re selling skeleton keys, it could be that you actually won’t rank as well for “Are skeleton keys real?” as someone who’s providing purely an informational document. If someone searches for antique skeleton keys, your document about “Are Antique Skeleton Keys Real?” might not rank as well as someone who actually sells them, because Google is trying to serve that intent, and they do a pretty good job with that. Then there might be some other algorithm elements in there like QDD, query deserves diversity. So maybe Google sees different intents for a search, and so they try and provide different results and you might rank because of that, or you might not rank because of that, or things like QDF where they say, “We need a fresh result here.” People are looking for recent documents around skeleton keys because there was a big item in the news about a break-in using skeleton keys. So we know we should put the news box in there and maybe we should have a document that’s much fresher, those kinds of things. This matters a ton because if searchers don’t engage with your piece, if they stand around and they go, “I don’t think I should click on that.” It doesn’t even take as long as I just took to say those words. You just make that split-second judgment as you’re scanning down a page of search results about whether something is relevant to your needs or not. Searchers are constantly asking themselves when they look at a set of results, “Should I click back? Should I reengage? Should I share and amplify the content once I reach it? Should I remember this brand or this page or bookmark it?” All of those kinds of things go into the search engine’s consideration set as well. They make their way in there through user and usage data. We know that Google can monitor and measure, certainly when you click back to the search results. We know that through Chrome and through Android and all these other things, Toolbar, that they can look at activity that’s happening on a website or through a search journey. We know they can see sharing and amplification data absolutely if it’s links. They can probably look at other kinds of amplification too. They definitely can look at people who remember a brand and search for a brand. So if someone searches for “Etsy skeleton keys,” that might be a strong signal to Google that they should rank Etsy’s page when people search for just skeleton keys. All of those kinds of things are making it in here. So we have to ask ourselves, “Does this match the need that I have? Are we creating pages that searchers feel matches their need?” They’re asking, “Do I recognize or trust this brand?” Or at least, “If I don’t know this brand at all, when I look at the URL and the domain name” — Bing did a big study on this a couple of years ago — they ask themselves, “Does that sound like a sketchy domain name?” For example, I did see antique-skeleton-keys.com ranking for this query. They’re still on page one. It’s not actually that terrible a page, although it has some kind of spammy AdSense all mixed in there. But it has some information. That kind of stuff, when searchers see that, they are less likely to click it because they’ve had bad experiences with multiple-hyphenated, keyword matchy domains. Antique-skeleton-keys.com, no offense, but you all aren’t doing that world an entirely big favor right now. Then they’re going to ask, “Does the snippet stand out and grab my attention?” If it does, more likely to get a higher click-through rate, more likely to get that engagement. So… how many times should I repeat my keywords? So these three big considerations lead us to some quick rules of thumb. 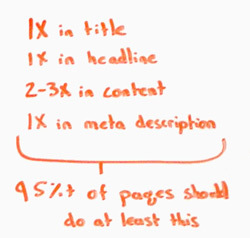 I’m going to say that for 95% of pages out there — not every single one, there are always going to be a few exceptions –but for 95% of the pages out there, you should do at least these things. I’ll put nice little boxes here to help out. Yes, I should have my keyword that I’m targeting, if I know that I’m going after this keyword, this search intent, that’s what the page is about, that’s the primary keyword target, I should target it at least once in the title element of the page. I’m going to say two to three times in content. That is a very rough rule. Generally speaking, if you don’t have the keyword at least a couple of times in the content of the page, unless you have an extremely visual page or an interactive page with almost no content, which maybe that would fall in the 5%, you should definitely be hitting that. Then one time in the meta description. Meta description is important because of the snippet aspect of it. Not that critical from like, “Oh, that will boost my ranking.” No, but it might boost your click-through rate. It might make you appear more relevant to the searcher as they’re searching through, and it will help target that. Again, sometimes in that 5% there, there might be times when a snippet is actually better without the keyword. Again, especially if it’s a long keyword phrase and you only have a little bit of room to explain things, okay. So 95% of pages should do at least this. Then many pages should also consider doing a little bit of image optimization with things like a keyword in the image alt attribute, assuming you have an image on the page. For a keyword like this, you would definitely want to have some pictures of what skeleton keys have looked like, do look like today, that kind of thing. The image file name itself too, which is important for image SEO. Images still get a good amount of search traffic. Even if you don’t get a ton of click-through rate, you might get people using your image and then citing it, and that could lead to link behavior. So we’re talking about a long tail here, but a valuable long tail. Once in the URL, generally this is important, but not critical, certainly not critical. There could be plenty of reasons why you have a perfectly reasonable URL that does not include the keywords many, many times. A homepage is a great example. Homepage, you don’t need to change your default homepage to include your keyword string so that when you request whatever, Etsy.com, it redirects to vintage antique skeleton keys. No, don’t do that. One or more times in the subheaders of the page. If you have multiple blocks of subheaders that are describing different attributes of a particular piece of content, well, go ahead, use your keywords in there as they might apply. Don’t go overboard. Another big rule of thumb. You can see my friend here. He’s being weighed down by his keywords. His ship has almost turned over. Search engines are going to use stemming. So stemming is basically saying, “I’m going to look at skeleton and I’m going to cut that down to ‘skelet’ so that if the word ‘skeletal’ or the words ‘skeletons’ or ‘skeletals’ or ‘Skeletor’ . . .” well, maybe Skeletor means a little something different. You guys remember He-Man, right? I know some of my viewers do. But that stemming is going to mean that lots and lots of repetitions of minor variance of a keyword are totally unnecessary. In fact, they can annoy searchers and people who are consuming that content, and they might even trigger the engine systems that say, “This is keyword stuffing. This is bad. Don’t do it.” Keyword stuffing, by the way, super easy to pattern match for engines. It’s going to make searchers click the Back button. So use a lot of caution if you’re thinking about that. What about on-page keyword use? Remember that on-page keyword use is only a small piece of the algorithm. We’re talking about a relatively small piece. You could get all of this absolutely perfect, or you could get only, say, 80%, just this stuff right, and the difference is pretty minute in terms of your ranking ability. So I would urge you not to spend too much time trying to go from, “Well, I hit these basic things that Rand talked about, but now I’m going to try and take my keyword targeting and on-page optimization to the absolute max.” You can get a very, very tiny extra amount of value. Likewise, plenty of searchers are searching for those topics as well. So if you don’t answer those queries and someone else does, well, they might click on you, but then they’ll click back. Or they might click on you, but they won’t share you or amplify you or link to you or bookmark you or remember your brand. You need all those signals in the modern on-page world. All right, everyone. Look forward to some great keyword targeting, some good questions in the Q&A and the comments below. I’ll see you next week for another edition of Whiteboard Friday. Take care.